So I do apologize for today's post being another "haul" post. I was planning on reviewing the virtual scavenger hunt that I participated in for a work event, but I'm not sure how to phrase what I thought of it. So, if you haven't seen from recent Instagram photos, Cupid has begun to crib. She has had a collar put on and had her feed changed from a sweet feed type to something more fiber based. In addition, we've also discussed the possibility of ulcers. Because she does not show any other signs of ulcers, putting her on an ulcer/digestive supplement has been discussed. After much research and discussion, I decided to try Uckele Equine's G.U.T. supplement which was available through SmartPak. I was excited to see this included in their Black Friday sale so quickly threw it in my cart. Because I try to get free shipping whenever I use SmartPak, and the deals were fairly good, I included a few extra items in this order. The first item was dewormer. 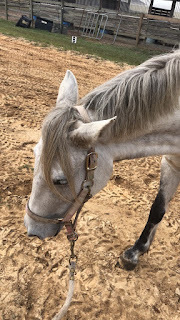 Every equestrian dreads having to deworm their horses and I'm no exception. But Cupid is due soon so a tube of Quest Plus was added to my cart. Thankfully, this was included in the sale so the price wasn't as painful as usual. The third item was also for Cupid. Because she needs to be dewormed I need to get an accurate weight on her. Enter the SmartPak Weight and Height tape. Hopeful, y this will give me a fairly accurate weight on her so we can avoid over or under-dosing with the dewormer. I like that this tape includes height measurement on one side so that I can determine if she really is 14.1 hands or if she's gone from the large pony to a small horse classification. The final item is something that I've had my eye on for awhile. I love the Kensington SmartPink line and have been trying to gather all the items. So far I have a grooming bag, fly mask with ears, and light turnout sheet (which might be for sale soon as it's a bit too small for Cue). The tall boot bag was discounted and included in the sale which brought the price down a considerable amount. After thinking about it for a few hours I added it to my cart and hit the purchase button. Even though my tall boots are from eBay I would still like to keep them as nice as possible. By storing them in a boot bag they should hopefully avoid unnecessary scratches and bending. I like that this bag has a divider in the middle to keep the boots from rubbing against each other too much. 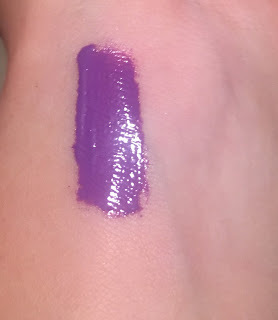 Today on the NYX Lippie Countdown I was a bit dismayed to see the preview as a bright purple. I'm starting to settle into the fact that purple lipstick will never be a color I can successfully pull off so I wasn' too happy to see that was today's color. Upon opening the tab I was a bit surprised to see that I liked the purple shade that was on the tube. Between the metallic cap and the collection name, Intense Butter Gloss, I knew this would be a shiny and bright purple. The shade is called Berry Strudel, and if this were a lipstick from the 90s it would probably be scented. One item that I found a bit strange was that the application is flat on two sides and not a doe foot like NYX typically is. After applying the color I was surprised to see that I didn't hate it. It is more of a gloss than a lipstick, and the shade is definitely not professional. But this would be a good color for having fun or a costume. It is extremely glossy and does not dry, which means that it gets on every glass that I use and needs to be reapplied several times throughout the day. Overall, this isn't a color that I would buy again but I do plan on using it while the sample lasts.